Adrift in Tokyo is the latest... well actually, it's not the latest. It's the film Satoshi Miki made two years before 2009's delightful Instant Swamp, but is just getting a DVD release now courtesy of the always reliable Third Window Films (who, for the sake of full disclosure, were kind enough to send a screener copy of the film our way). I'm of the opinion that Miki is one of contemporary cinema's most consistent entertainers, and Adrift in Tokyo mostly cements his status as a purveyor of charming, offbeat comedy-drama. Fumiya (Jo Odagiri) is a directionless student in his seventh year of college, and has racked up a huge debt. When Fukuhara (Miura Tomokazu) calls around to collect the money (aggressively, of course), it seems as if our wild-haired hero isn't long for this world. But Fukuhara presents him with a proposition - that Fumiya simply join him on a walk around Tokyo, for however long it takes. The reward is a million-yen to pay off his ever spiraling student loans. The debt long since overdue, Fumiya reluctantly agrees and the two embark on a lengthy wander through the great metropolis. There's certainly a sort of non-romantic Before Sunset feel to Adrift in Tokyo, and the film takes ample time to absorb the city. It's not always a hugely affectionate portrait of Japan's capital, but then Tokyo isn't always the most colourful place in the world. But it gets the feel of the sprawl across - both the all consuming urbanisation and the more energetic, unique side: from cosplay parties - including a character donning a Rei Ayanami costume for the EVA geeks - to a brilliant opening tracking shot through a manic market block. Storywise, viewers familiar with Miki's earlier work may well find this a more sombre and considered piece of work. 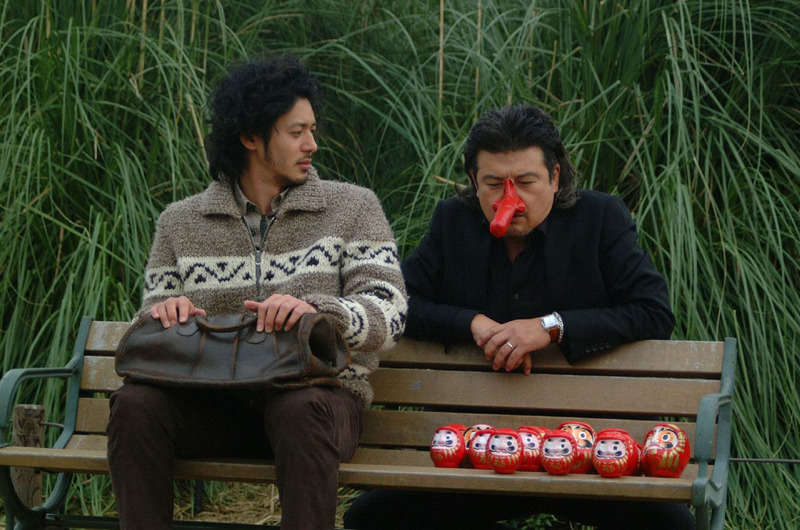 Not that there aren't moments of his characteristic eccentric, warm humour throughout - brief tangents spent with Fukuhara's wife's co-workers wield rich comic gold particularly, and the park bench scene in the picture above is delightful. But there's significant insight and character development to be found amidst the bursts of wackiness. I'll admit to thinking the film didn't know where it was going during the second act (arguably appropriate for a film about two characters 'lost' in a sprawling cityscape), but the subtle pleasures to be found in the last half-hour ended up taking me by surprise. We discover things about the characters in unexpected ways and in unexpected places. It's a shame that some of the sub-characters 'drift' in-and-out of the story before we have time to get to know them, but ultimately all the interactions are there to help the audience learn more about the central ambling duo. This is very much a two-player piece, and the two leads play off each other impressively. Both characters are floating through the city for very different reasons. Fukuhara keeps mentioning that he has killed his wife, but Fumiya and the audience are constantly uncertain whether to trust him. Fumiya himself is a character without a distinct place in the world. His past is revealed through throwaway dialogue and surprisingly affecting flashbacks. Ultimately, the characters find out more about themselves as they encounter strangers as well as significant figures from their past. But it's their slow-forming and uneasy bond that gives the film a carefully considered forward momentum. It may lack the manic energy of Turtles Are Surprisingly Fast Swimmers and Instant Swamp, and the film has a sometimes indistinct visual identity (bar a few impressive images). However, it's great to see Miki displaying a notable flair for thoughtful drama alongside the expected belly laughs. On one hand, Adrift in Tokyo is definitely a very enjoyable and accessible piece of work. But it's also extremely thoughtful and bittersweet, and a pleasant departure from the more madcap (if equally endearing) other films. He hasn't made a feature in almost three years now - let's hope it won't be too long before his increasingly distinctive filmography receives further additions.